And to make things even more interesting the date display alternates between German and English if you are brushing up on your German language skills. Verified Owner Comments: Everyone already knows the 104 is a great watch, it does not disappoint. I favor the white face and the bracelet is great, glad I elected for it. Verified Owner Comments: Umm What can I say this is a fantastic and beautiful time piece, love the white dial thanks watchbuy, I would love to purchase another watch from you guys in the future! Verified Owner Comments: I have had this watch for about two weeks now and I am more than pleased. The craftsmanship is superb. The time keeping is spot on. Very comfortable to wear. This is my perfect daily watch. 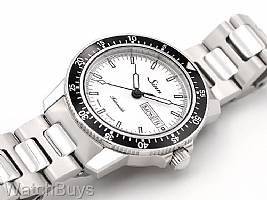 Verified Owner Comments: I already had a Sinn 104 with the black dial so I knew what I was getting. I like them both but find the white dial a bit more distinctive and different. The size for me is perfect because my wrist is on the thin side. At 41mm that's about as large as I go but because this watch is not too thick it wears well on a smaller wrist and under a shirt cuff. I love the clean dial and fine markers. It's also a great value within the Sinn lineup. Highly recommended. "Great watch and great transaction"
Verified Owner Comments: The buying experience from WatchBuys was fantastic. I received a personal email when the watch became available. And it was just my luck I only had to wait a few days. The customer service was so helpful as I could tell I was emailing with an actual employee, not an off-shore support service. I received the watch very quickly. Within 2-3 business days of purchase I believe. And the watch itself is amazing. The Sinn 104 (white dial) is a wonderful addition to my collection.